TLT has been trading in a tight range for the last several months, making short stabs at breaking lower but finding support at tests of prior swing lows. I lean to support failing over the next several months and pushing for a rough support area of 112.00 to 110. It is normal that the recent rise is slowing as previous highs are tested but do think we should at least see the channel tested on the monthly chart, around 3.27%, or the first fib extension up at 3.35% is tested before much of a retrace. 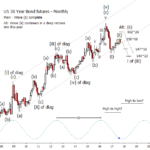 Bonds are staying on track with the primary forecast of a breakdown out of the ending diagonal that finished in 2016. Best if price pushes under the March 2017 low before much of a bounce. 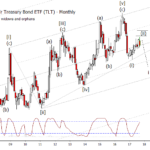 The bond charts look favorable for a move lower into next year. The alternate is that the wave (ii) is not yet finished though it is becoming a more distant possibility. As you would expect, the analysis here is very similar to that done on bond futures earlier. This looks like a wave (ii) bounce though it is too early to rule out another test of overhead resistance. The major theme in bonds for the last six months has been that we are in a wave (ii) bounce after the first major impulse down from the 2016 high. A break of the low of last month should be the first major confirmation that bonds are ready to turn down. Now it appears that rates may be ready to begin advancing again.